DJI adheres to continuous innovating and improving, with the new firmware, new attitude stabilization algorithm and optimized hardware structure, the Naza-M V2 provides better flight performance. The innovative All-in-one design simplifies installation and saves space and weight. It contains inner damping, controllers, 3-axis gyroscope, 3-axis accelerometer and barometer in its light and small Main Controller. It can measure flying altitude, attitude and therefore can be used for autopilot/automatic controlling. The latest fourth generation attitude stabilization algorithm not only inherits the outstanding flight stability of DJI products, but also provides excellent maneuverability. It is more flexible and stable, and gives the hobbyists a wonderful flight experience. New features have been added, such GPS automatic course compensation, GPS & Compass sensor calibration, new take-off mode and more. Naza-M V2, with PMU V2 module with CAN BUS port, could support iOSD, GoPro gimbal, Bluetooth LED module and so on. 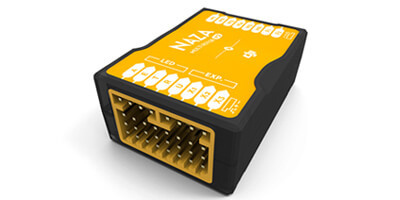 And Naza-M V1 is compatible with Naza-M V2 PMU as well. Please check the chart below.